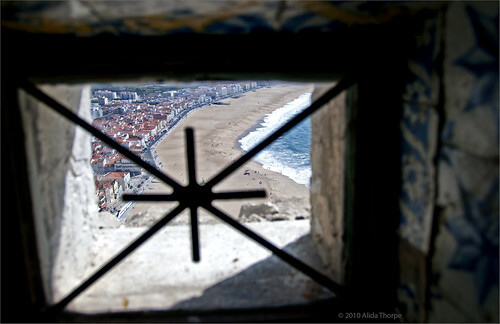 Capela da Memória, a photo by Alida's Photos on Flickr. "On the edge of the cliff stands the Capela da Memória, where, in 1182, according to legend, the Virgin Mary saved the nobleman Dom Fuas Roupinho. He was chasing a white deer (the devil in disguise) in thick mist, when the Virgin stopped his horse as it was about to follow the deer over the cliff. The chapel was built in gratitude and the azulejo tiles inside portray the legend. Nearby there is a pillar with an inscription commemorating Vasco da Gama’s visit here after his voyage to India, to give thanks to Nossa Senhora de Nazaré for his safe return."